Take yourself on a captivating journey around Moree and it's region. 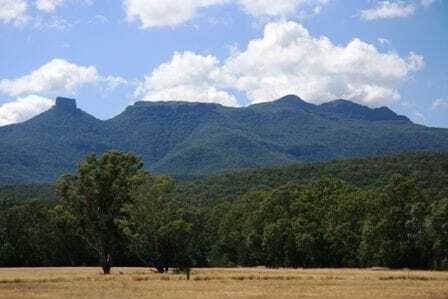 Located on the edge of the NSW north west slopes, centred on the Nandewar Range. The range's distinctive landform is a result of volcanic activity which occurred about 17-21 million years ago during the Miocene Epoch. The park represents a distinct contrast to the surrounding expanse of agricultural plains. Elevations in the park range from 400 - 1510 metres above sea level and dramatic changes in vegetation and temperature are evident. Lower elevations exhibit open eucalypt woodlands containing ironbark and cypress pine. Open rocky outcrops are dominated by heathlands exhibiting a multitude of species,while the highest peaks provide a scene dominated by snow gums, blackwood and snow grass. Mount Kaputar National Park was once occupied by Kamilaroi speaking Aboriginal people. The Park contains evidence of Aboriginal occupation including scarred trees and shelters containing stone flakes and artefacts. Throughout the Park there are remnants of past grazing practices. A settlers cottage which was owned by a pastoralist named Archie Scutt is located in Horsearm Creek. This site is frequently visited by bushwalkers. Recent restoration works and a conservation plan incorporates visitation and ensures correct management to protect the site. Numerous sites are found within the park and Bark Hut camping site was originally a logging site. An area of 775ha around the summit of Mt Kaputar became a reserve for public recreation in 1925. The reserve later grew significantly and Mt Kaputar now covers an area of 49,779ha. A large proportion of the Park is declared wilderness and is home to a number of rare and threatened plants and animals. These include the brush-tailed rock-wallaby, koala, turquoise parrot, square-tailed kite, yellow-bellied glider, little and common bent-wing bats, tiger quoll, burrawang (cycad), mint bush and helmet greenhood. Fire management including burning for ecological and fuel reduction purposes occurs throughout the park. Noxious animals and weeds are managed by either trapping, baiting, shooting or spraying. The road from Narrabri to Dawsons Spring is suitable for conventional 2WD vehicles. Caravans are not permitted within the Park as the road is steep and narrow in parts. Trailers are permitted. The majority of the road is gravel. Allow 2 hours for a return journey from Narrabri. There are no public phones or provisions (eg. food, drink or ice) available in the park. Please use a fuel stove for cooking or bring your own firewood. Climate varies vastly from season to season ranging from below freezing in winter to the mid 30s in summer. Daily winter average termperature is 7 degrees Celcius and summer average is 21 degrees Celcius. Generally rainfall is centred on the summer months. Camping and picnic areas in the park are available. Bark Hut and Dawsons Spring are the specified camping areas. Neither campsite is powered. Fees apply and these are payable on site via an honesty box system. Two of the cabins contain 1 double bed, 1 double bunk and 2 trundle beds. The third cabin contains a double bed and is suitable for one person or a couple. Please bring your own linen and bedding. A slow combustion heater (wood provided) ensures warmth. All cabins have septic toilets and hot showers. Crockery, cutlery, kitchen utensils, microwave, stovetop, kettle and toaster are also provided. A minimum of 2 nights booking is required. A jumble of giant boulders heaped in the most fantastic positions by a past volcanic upheaval featuring excellent picnic facilities, Suspension Bridge, a peaceful, relaxing spot. Birdlife and wildlife sanctuary and a viewing platform. 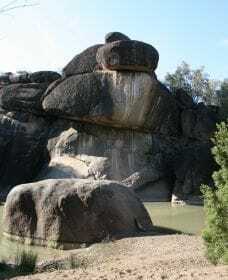 Cranky Rock is classified as a Nature Reserve. Walking trails are established to suit either an easy stroll or a more challenging walk for the adventurous hiker. The name Cranky Rock was derived from an old legend which said that an old "Cranky Chinaman" jumped to his death from the highest point of the balancing rocks after being accused of some wrong doing. Visitors can go fossicking along the creek. Signs of Aboriginal life can be seen within the nature reserve amongst the many plant life. Free barbeques, camping area, power available, kiosk and bush shower facility. There have been many massacres and slaughter of Aborigines that have gone unrecorded in Australian history, but the Myall Creek Massacre, stands out, as the only one of its type, where the perpetrators were punished for the crimes against Aboriginies. On the 10th June 1838, twelve armed stockman rode onto Henry Dangar's property at Myall Creek in Northern NSW, near Bingara, and rounded up, like animals, twenty eight friendly Aboriginal, elderly men, women and children. They were the relatives of the Aboriginal men who were working with the station manager, William Hobbs. The twelve stockman then dragged the Aborigines into the bush and slaughtered every last one. Their bodies were then burnt. The cowardly attack on the elderly Aboriginal men, women and children was well planned. When William Hobbs returned and discovered the attack, he immediately began his own investigation into the atrocity. He went to the site of the massacre, questioned other employees of the station and let it be known that he intended to report the matter to his employer, Henry Dangar, as well as the authorities. On the 24th June, Frederick I. Foot, a landholder, travelled to Muswellbrook to report the incident. On arrival at Muswellbrook, Foot discovered he had missed the police magistrate so decided to travel onto Sydney to report the incident there. On the 4th July, Foot wrote an account of the incident for the attention of Govenor Gipps. Govenor Gipps ordered an investigation into the incident with the view to prosecution. There was a great deal of antagonism against the Government for this decision. Unfortunately, colonial Australia was extremely racist and Victorian in their thinking and treated Aborigines as pests, and animals to be exterminated. Later, when the perpetrators were put on trial, one juror was quoted in the Australian Newspaper as saying, "I look on the blacks as a sort of monkey and the sooner they are exterminated from the face of the earth, the better. I knew the men were guilty but I would never see a white man hanged for killing a black. " The hanging of the Myall Creek murderers caused great outrage in Sydney, but there were many colonists that were outraged at the massacre of Aboriginal people, but unfortunately, those colonists were the minority! One hundred and sixty two years after the massacre, a memorial to the Wirrayaraay Aborigines of Myall Creek was dedicated on the 10th June 2000. An annual memorial service has been held on 10th June, at the site of the massacre, ever since. Colin Isaacs is the artist who painted the original artwork from which the engravings on the seven plaques along the memorial walkway of the Myall Creek Memorial were made. 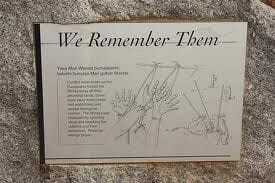 To visit the Myall Creek Massacre Site travel 109km East on the Gwydir Highway until you reach Delungra. Once in Delungra, turn right at the Post Office. Follow this road for approximately 20kms, 300 metres past the Myall Creek Bridge turn left onto Whitlow Road. Follow Whitlow Road fro approximately 200 metres until you reach the car park. Immerse yourself in the wonder of nature as you take a walk through the magnificent Waa Gorge. 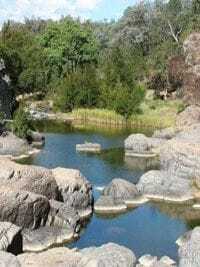 Pronounced 'War' Gorge, this beautiful haven is located 85km to Moree's east in the Mount Kaputar National Park. On your journey you will travel through rich fields of chocolate brown to black soil with many and varied crops, including organic olive groves, surrounding you on all sides. As you walk into the Gorge you will experience a sense of awe only nature can inspire. The track to the Gorge is not signposted. From the carpark, a fifteen minute walk through a picnic area leads you to Mill Bullah (meaning two eyes) waterholes. 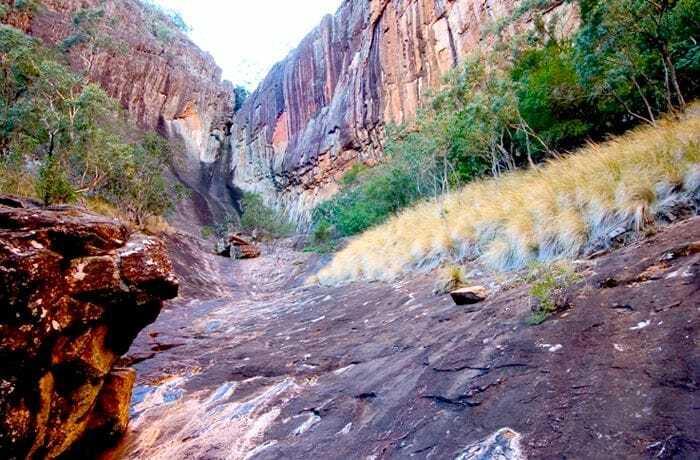 Climb the small hill on the left of the waterholes and walk beside the creek for a few hundred metres until the track finds its way into the rocky bed of the creek which leads to the Gorge. The entire walk to the gorge takes about three quarters of an hour. Lush ferns, Moreton Bay Figs and some thriving species of rainforest plants cling to the crevices between the boulders, resisting the force of water which torrents down the creek after the rain. As you round a sweeping bend in the creek, the 100 metre high tangerine streaked walls and the jumble of boulders strewn across the floor of the gorge, put one in mind of stumbling into a giant's playroom. No camping is permitted at Waa Gorge & DRY WEATHER ROAD ONLY. Free Wood BBQ and basic Toilet Facilities. Waa Gorge is extremely impressive, and is a deeply cut gorge that soars up to 70 metres high. Towering above the gorge is Mt Waa, which is a volcanic-plug formed from the core of one of the earliest vents of the Nandewar Volcano. The volcano became inactive 17 million years ago and the area around Mt Waa contained enormous cracks and fault lines in the volcanic rock. Weathering of these cracks and faults over millions of years has left behind deeply etched gullies and gorges. Waa Gorge and its side gorges are the result of this weathering process, formed mainly by water flowing down from Mt Waa itself. The walk is also a botanical delight and there are many moist, sheltered areas displaying remants of the ancient rainforests that stood in the area including Moreton Bay Figs, Lilly Pilly and a variety of ferns and other enchanting species. Waa Gorge is a must see, the scenery is breathtaking, the likes of which can only be seen in some of Australia's most unique and remote areas. As access to this attraction involves travelling through private property please contact the Visitors Information Centre or National Parks to check access can be gained. The Rocky Creek glaciation existed 290 million years ago in the Carboniferous Period. A vast amount of weathering and erosion has occurred over the past 200 million years, so all the original glacial landscape features have been eroded and replaced by those typically associated with running water. The fluvio-glacial conglomerate rocks found in the bed of Rocky Creek show the glacial past of this landscape. The Glacial area is a great swimming area, picnic spot and camping is permitted however the only facilities available are toilets. Access via Terry Hie Hie Road is unsealed along portions of the road.DRY WEATHER ROAD ONLY! Please contact Moree Visitor Information Centre to check access to area.